Trace in Porterville, CA – ADOPTED! 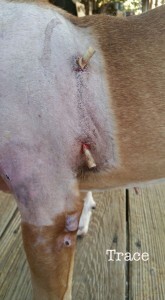 | Bull Terrier Rescue, Inc. 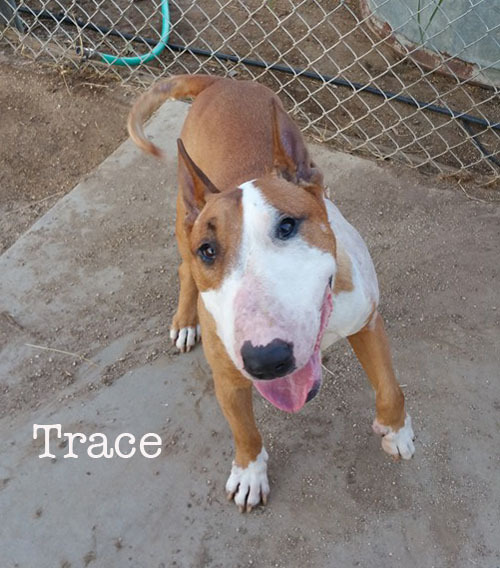 Trace in Porterville, CA – ADOPTED! Our heartstrings were pulled in a major way when the shelter called us about Trace who is about 7-8 years old – he was not walking and was so depressed. We rescued this sweet guy and after vetting, antibiotics, surgery to remove abscesses on one of his front legs, and a wonderful diet from his foster mom, he is good as new! He is great with other dogs and finds horses interesting in a good way. His energy level is pretty low and he is one of most affectionate guys you’ll ever meet. Do you have a spot for this wonderful 45lb guy to hang his hat?